Description: "This isn't exactly a quest... I just want to invite all you hunters to my shop. Those of you looking for a change... welcome." This a "quest" which is more of a shop. 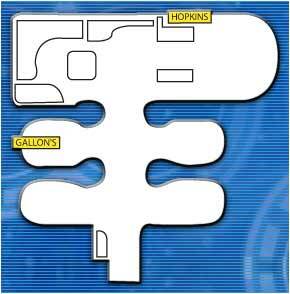 Go to the area marked Gallon in the city map and you will be taken to his secret shop using the transport option. There are a couple things you can do. You can get music discs using 30 Gallons points or by buying it for 10000 meseta each. This disc will change the backgroung music of the game. There is a total of 7 music discs, 5 are available now (depending on your version). To gain points, there is a mini 8 second game that you can play inside the shop. The better the score, the more points you get. There is also a guild card quantity checker. The better the quantity, the more points you get as well. In Blue Burst, Gallon sells Walls for 300 Gallon points (you must have precisely between 300 and 310 points). These walls match your Character Class, for instance, a ranger will get the Ranger Wall. Forces will get the Force Wall, and Hunters will get the Hunter Wall. After collecting the 300 points, go up to Gallon and talk to him. He'll present you with a "Buy ???" option. If you choose it, the Wall will appear in your inventory. Also, you can win prizes from the roulette mini-game. In order to be able to play this game, you must earn Lucky Coins from the Phantasmal World quests. After that, you get one spin per coin. The prize you receive will be based on the NPC on which the cursor lands. Here are the prizes: Little Boy = Sol Atomizer, Nurse = Scape Doll, Natasha Milarose = HP or TP mat, Gallon = Monomate, Nol = 9* weapon with hit percentage, and Paganini = Gods Shield Genbu or Gods Shield Seiryuu or Photon Drop on BB or Black Gear or Photon Drop on GC/XBox. Keep in mind that the weapons that Nol will give you correspond to your character class. So, if you are a Ranger, you'll receive Shots, Mechguns, Rifles, and Handguns. Hunters and Forces will receive their own respective sets of weapons. You can also exchange photon drops for items in this shop quest. Just bring the appropriate number of photon drops along and talk to Hopkins. He'll take you to Paganini. You can find the exchange rates by looking at the charts below. Keep in mind that the amount listed in the chart is the minimum at which the item will be offered. The more Photon Drops you bring, the greater your odds of the item turning up that you want. If you have successfully completed the online East Tower quest, and taken the necessary steps, Paganini will be able to add specials to you S-rank weapons. Also, you will be able to add percentages to your weapons ifif you have successfully completed the online West Tower quest and taken the necessary steps. You can see what specials can be added by clicking here. Please note that for Blue Burst, Jellen and Zalure cost 60 photon drops. Also, the Zalure level has been reduced to 33. Item: chocolate was also available during the Valentine's Event.